This recipe for bordelaise sauce is a classic French sauce using red wine. The sauce is named after the famous wine-growing region of Bordeaux in Southwest France. 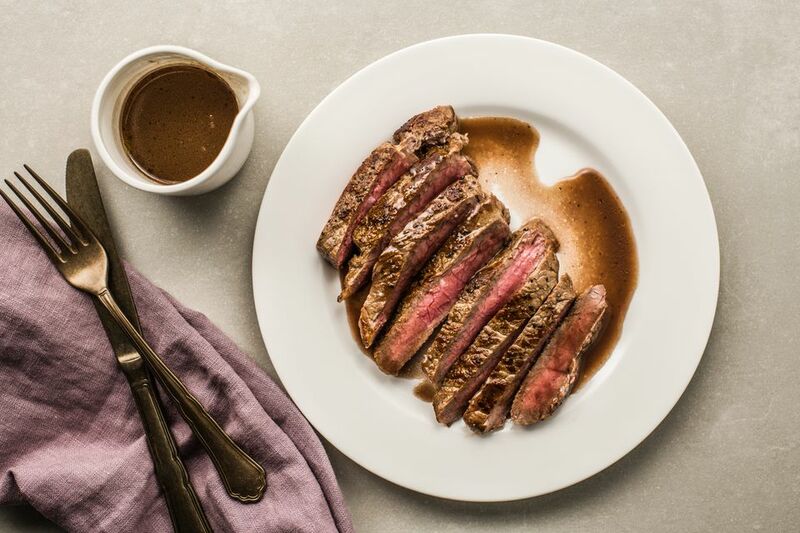 Rich and flavorful, it takes just a small drizzle of bordelaise sauce to perk up a simple, grilled steak or slow-roasted beef. This tangy and savory red-wine sauce also is a great accompaniment to roasted potatoes. Traditionally, the sauce would be made using a Bordeaux wine, but wines from that region are some of the most expensive in the world. Barring a Bordeaux, a good-quality dry red wine will suffice. The French wine is typically made with cabernet sauvignon, cabernet franc, merlot, and malbec, so any dry red wine made with those grapes is likely to be comparable for the purposes of making the sauce. The sauce can be made right before serving time, or up to a day in advance, using a special insider's trick to keep a skin from forming over the surface of the bordelaise. In a small saucepan, place the red wine, shallots, thyme, and bay leaf and set over medium heat. Bring the mixture to a rolling boil and continue to cook to reduce the contents to half of the original volume. Add the beef stock to the pan and bring the mixture up to a boil again. Skim and discard any foam that appears on top of the sauce using a tablespoon. Continue cooking the bordelaise until it has thickened enough to coat the back of a spoon—otherwise known as having a nappe consistency. To check, simply dip a tablespoon into the sauce and swirl it around. Lift the spoon and flip it over to look at the back. The sauce should have coated the spoon but if it quickly runs off, it is not yet thick enough and needs to be cooked more. Pour the sauce through a fine-mesh sieve. Season the sauce with salt and pepper, to taste. Use on grilled steak or slow-roasted beef and enjoy! If you are holding the sauce for later, lightly rub cold butter across the hot surface of the sauce, to prevent a skin from forming. Alternatively, lay a piece of greaseproof parchment paper cut to the size of the pan, onto the surface of the sauce. The quality of your bordelaise sauce depends on the wine you use. The rule of thumb for using wine in your cooking is to never cook with wine you would not drink. Saving old, leftover wine for cooking or buying "cooking" wine is a false economy. Instead, this recipe uses the equivalent of one glass of wine to make the best-quality sauce, while you can then enjoy the rest of the bottle before or during your meal.